abbreviation for quantitative computed tomography. A type of CT scan used to measure density of bone in the vertebrae or in the extremities (peripheral QCT), usually the wrist. QCT is rarely used because it is expensive, results in higher radiation exposure, and is less accurate than DEXA, P-DEXA or DPA. A computerized x-ray scanning system that produces a sectional anatomic image. It is achieved by digital processing of x-ray attenuation coefficients from a 360° wedge scan of ionizing radiation. There is considerable use of data from the attenuation coefficients in diagnosis. Computed tomography is colloquially called a cat scan. CT scans expose patients to radiation on the order of 10 mSv per scan. Educational materials about the potential risks and benefits of scanning should be provided to patients to ensure that scans are performed safely and carefully. Cross-sectional body imaging that reconstructs pictures of internal organs based on measurements of their electrical activity as detected by electrodes placed on the surface of the body. An examination from head to toe of the body with computed tomographic imaging, promoted as a screening test for cancer and other illnesses. The test exposes patients to high levels of radiation, reveals more false positive findings than true positives, and is expensive. A confocal laser scanning system that produces three-dimensional images of the posterior segment of the eye. It is used to diagnose and treat glaucoma. 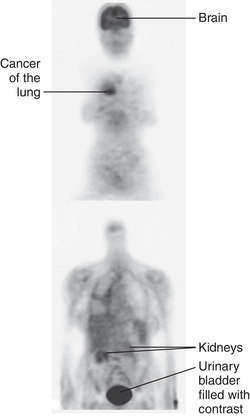 Computed tomographic (CT) images that are obtained as the CT table moves continuously during a single, held breath. Detailed evaluation of dynamic internal features is feasible with this technique. A radiographical method used to obtain high-resolution cross-sectional images of tissues and their defects, e.g., of the structures of the eye. Reconstruction of brain sections by using positron-emitting radionuclides. By using several different radionuclides, researchers can measure regional cerebral blood flow, blood volume, oxygen uptake, and glucose transport and metabolism, and can locate neurotransmitter receptors. PET has been used with fludeoxyglucose F 18 to identify and localize regional lymph node metastases and to help assess response to therapy. A method for determining the bone mineral density of a three-dimensional bony specimen, e.g., in the vertebral bodies or the forearms. It is used in the diagnosis of osteopenia and osteoporosis. A medical imaging method for reconstructing sectional images of radiotracer distributions. Computed tomographic scanning that uses the inert gas xenon to improve the visual distinction between healthy and abnormal tissues, esp. to visualize blood flow to different regions of the brain in stroke. Synonym/acronym: DEXA, DXA, SXA, QCT, RA, ultrasound densitometry. Dual-energy x-ray absorptiometry (DEXA, DXA): Two x-rays of different energy levels measure bone mineral density and predict risk of fracture. Single-energy x-ray absorptiometry (SXA): A single-energy x-ray measures bone density at peripheral sites. Quantitative computed tomography (QCT): QCT is used to examine the lumbar vertebrae. It measures trabecular and cortical bone density. Results are compared to a known standard. This test is the most expensive and involves the highest radiation dose of all techniques. Radiographic absorptiometry (RA): A standard x-ray of the hand. Results are compared to a known standard. Ultrasound densitometry: Studies bone mineral content in peripheral densitometry sites such as the heel or wrist. It is not as precise as x-ray techniques but is less expensive than other techniques. To evaluate bone density related to osteoporosis. Lumbar spine, heel, hip, wrist, whole body. Bone mineral density (BMD) can be measured at any of several body sites, including the spine, hip, wrist, and heel. Machines to measure BMD include computed tomography (CT), radiographic absorptiometry, ultrasound, SXA, and most commonly, DEXA. The radiation exposure from SXA and DEXA machines is approximately one-tenth that of a standard chest x-ray. Osteoporosis is a condition characterized by low BMD, which results in increased risk of fracture.The National Osteoporosis Foundation estimates that 4 to 6 million postmenopausal women in the United States have osteoporosis, and an additional 13 to 17 million (30% to 50%) have low bone density at the hip. It is estimated that one of every two women will experience a fracture as a result of low bone mineral content in her lifetime.The measurement of BMD gives the best indication of risk for a fracture. The lower the BMD, the greater is the risk of fracture.The most common fractures are those of the hip, vertebrae, and distal forearm. Bone mineral loss is a disease of the entire skeleton and is not restricted to the areas listed.The effect of the fractures has a wide range, from complete recovery to chronic pain, disability, and possible death. The BMD values measured by the various techniques cannot be directly compared. Therefore, they are stated in terms of standard deviation (SD) units.The patient’s T-score is the number of SD units above or below the average BMD in young adults. A Z-score is the number of SD units above or below the average value for a person of the same age as the measured patient. Since bone loss occurs naturally as part of the aging process, using a patient’s Z-score in comparison to a person of the same age could be misleading, especially in the early development of osteoporosis.The World Health Organization has defined normal bone density as being within (above or below) 1 SD of the mean for young adults. Low bone density is defined as density below 1 SD and 2.5 SD the mean for young adults, bone density 2.5 SD or more below the mean for young adults is indicative of osteoporosis (osteopenia), and bone density more than 2.5 SD below the mean for young adults is defined as severe (established) osteoporosis. The baseline age for young adults is approximately 30 years of age. For most BMD readings, 1 SD is equivalent to 10% to 12% of the average young-normal BMD value. A T-score of −2.5 is therefore equivalent to a bone mineral loss of 30% when compared to a young adult. high alertPatients who are pregnant or suspected of being pregnant, unless the potential benefits of a procedure using radiation far outweigh the risk of radiation exposure to the fetus and mother. Normal bone mass with T-score value not less than −1. Osteoporosis is defined as T-score value less than −2.5. Low bone mass or osteopenia has T-scores from −1 to −2.5. Fracture risk increases as BMD declines from young-normal levels (low T-scores). Low Z-scores in older adults can be misleading because low BMD is very common. Z-scores estimate fracture risk compared to others of the same age (versus young-normal adults). BMD test results may be lower in individuals receiving corticosteroid therapy; ideally BMD testing should be performed before a patient is placed on a regimen of chronic steroid therapy to obtain a valid baseline. Inability of the patient to cooperate or remain still during the procedure because of age, significant pain, or mental status. Metallic objects within the examination field (e.g., jewelry, earrings, and/or dental amalgams), which may inhibit organ visualization and can produce unclear images. The use of anticonvulsant drugs, cytotoxic drugs, tamoxifen, glucocorticoids, lithium, or heparin, as well as increased alcohol intake, increased aluminum levels, excessive thyroxin, renal dialysis, or smoking, may affect the test results by either increasing or decreasing the bone mineral content. Consultation with a health-care provider (HCP) should occur before the procedure for radiation safety concerns regarding younger patients or patients who are lactating. Pediatric & Geriatric Imaging Children and geriatric patients are at risk for receiving a higher radiation dose than necessary if settings are not adjusted for their small size. Pediatric Imaging Information on the Image Gently Campaign can be found at the Alliance for Radiation Safety in Pediatric Imaging (www.pedrad.org/associations/5364/ig/). Risks associated with radiation overexposure can result from frequent x-ray or radionuclide procedures. Personnel in the room with the patient should stand behind a shield, or leave the area while the examination is being done. Personnel working in the examination area should wear badges to record their radiation exposure level. Vertebral fractures may cause complications including back pain, height loss, and kyphosis. Limited activity, including difficulty bending and reaching, may result. Patient may have poor self-esteem resulting from the cosmetic effects of kyphosis. Potential restricted lung function may result from fractures. Fractures may alter abdominal anatomy, resulting in constipation, pain, distention, and diminished appetite. Potential for a restricted lifestyle may result in depression and other psychological symptoms. Possible increased dependency on family for basic care may occur. Positively identify the patient using at least two unique identifiers before providing care, treatment, or services. Patient Teaching: Inform the patient this procedure can assist in assessing bone density. Obtain a history of the patient’s complaints, including a list of known allergens, especially allergies or sensitivities to latex, iodine, seafood, contrast medium, anesthetics, or dyes. Note any recent procedures that can interfere with test results, including examinations using iodine-based contrast medium. Record the date of the last menstrual period and determine the possibility of pregnancy in perimenopausal women. Obtain a list of the patient’s current medications, including herbs, nutritional supplements, and nutraceuticals (see Effects of Natural Products on Laboratory Values online at DavisPlus). Review the procedure with the patient. Address concerns about pain related to the procedure and explain that some pain may be experienced during the test, or there may be moments of discomfort. Inform the patient that the procedure is usually performed in a radiology department by a HCP, and staff, specializing in this procedure and takes approximately 60 min. Instruct the patient to remove jewelry and other metallic objects from the area to be examined. Note that there are no food, fluid, or medication restrictions unless by medical direction. Sensitivity to social and cultural issues, as well as concern for modesty, is important in providing psychological support before, during, and after the procedure. Observe standard precautions, and follow the general guidelines in Patient Preparation and Specimen Collection. Positively identify the patient. Ensure that the patient has removed all external metallic objects from the area to be examined prior to the procedure. Instruct the patient to void prior to the procedure and to change into the gown, robe, and foot coverings provided. Patient’s clothing may not need to be removed unless it contains metal that would interfere with the test. Avoid the use of equipment containing latex if the patient has a history of allergic reaction to latex. Instruct the patient to cooperate fully and to follow directions. Instruct the patient to remain still throughout the procedure because movement produces unreliable results. Place the patient in a supine position on a flat table with foam wedges, which help maintain position and immobilization. Inform the patient that a report of the results will be made available to the requesting HCP, who will discuss the results with the patient. Recognize anxiety related to test results, and be supportive of perceived loss of independent function. Discuss the implications of abnormal test results on the patient’s lifestyle. Provide teaching and information regarding the clinical implications of the test results, as appropriate. Provide contact information, if desired, for the National Osteoporosis Foundation (www.nof.org). Reinforce information given by the patient’s HCP regarding further testing, treatment, or referral to another HCP. Answer any questions or address any concerns voiced by the patient or family. Depending on the results of this procedure, additional testing may be needed to evaluate or monitor progression of the disease process and determine the need for a change in therapy. Evaluate test results in relation to the patient’s symptoms, previous BMD values, and other tests performed. Related tests include ALP, antibodies anticyclic citrullinated peptide, ANA, arthrogram, arthroscopy, biopsy bone, bone scan, calcium, CRP, collagen cross-linked telopeptides, CT pelvis, CT spine, ESR, MRI musculoskeletal, MRI pelvis, osteocalcin, PTH, phosphorus, radiography bone, RF, synovial fluid analysis, and vitamin D.
Refer to the Musculoskeletal System table at the end of the book for related tests by body system. The major strength of this study is that it is the first one to use QCT to demonstrate vertebral BMD changes in patients with lumbar spondylolysis. Multivariate linear regression was used to estimate the effect of BMI, GOLD stage, age, inhaled steroids, and DXA measurements on QCT measurements. Antioxidant Effects of ACE and QCT Are Mediated by ERK1/2 Phosphorylation and p38MAPK Dephosphorylation. significantly blocked the gastro protection produced by QCT and L-arginine (600 mg/kg, i. Early studies of QCT emphasized its poor precision and high radiation dose, both of which resulted in low acceptance among clinicians. The companies are partnering on solutions based on servers and storage from Quanta QCT and interconnect technology from Mellanox to deliver unprecedented price performance on cloud computing for enterprise and service provider data centers. For the past five years, Amon has been responsible for Qualcomm's semiconductor business, first as co-president of QCT and a member of Qualcomm's executive committee and then as president of QCT for the past two years. Such errors can be avoided through the use of DXA lateral projection scans or QCT. Thompson has been a member of Qualcomm's executive committee since 2012 and has led QCT engineering since 2004. It substantially all of Qualcomm's engineering, research and development functions, and substantially all of its products and services businesses, including its semiconductor business, QCT. the world's leading provider of open source solutions, and QCT (Quanta Cloud Technology), a global datacenter solution provider, today announced plans to combine key Red Hat offerings - including Red Hat Enterprise Linux OpenStack Platform, Red Hat Ceph Storage, and Red Hat Enterprise Linux - with QCT's family of servers, storages and network switches.